Pharrell Williams visited the Chanel’s 3.55 Métier Class for the most recent episode of Chanel’s 3.55 Métier Class series in conversation with Tyler Brûlé where he talked about ambitions and the start of his Chanel journey and much more, you can check out the Podcast HERE. In the song One More Chance, Notorious BIG raps, “bags by Chanel, Baby Benz traded in your Hyundai XL”. 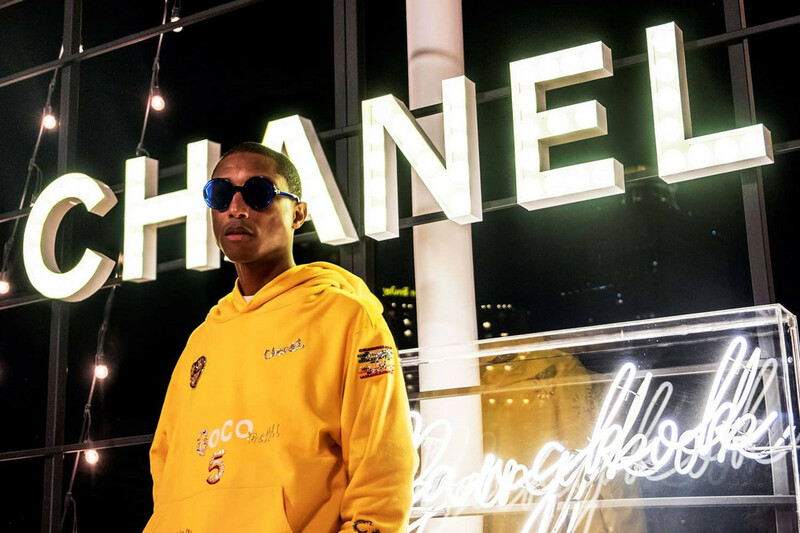 Listening to the song during his youth, Pharrell felt it represented Chanel as something to aspire to, and was a testimony to its timeless appeal and the long-lasting nature of its legacy and Pharrell has actually been repping Chanel for a long time now, and describes it as the “perpetual child” in him. He began by drawing Chanel’s iconic double-C logo on his shoes, another design involving a bold Chanel Paris logo. He wore them out proudly, and his sketches ended up getting reposted by Chanel on Instagram. He laughed off suggestions of a collaboration, thinking it was a distant fantasy. He cites “attention to detail” as the key. Taking into account the small things allows him to have the same mindset in the face of the task at hand, be that backstage concert prep or choosing a fabric. He’s always thrived off details, bringing sharp observations and fine-tuned intuition to the Chanel creative process. He draws inspiration from all over and feels that the luxury megabrand appreciates that part of him, supporting him and listening to his every contribution. The line, dubbed #ChanelPharrell by Karl Lagerfeld and set to be revealed to the world in a matter of days, is super wearable with bright splashes of colour for good measure. It’s heavily inspired by the Chanel staples that are his absolute must-haves and have been the foundations of his wardrobe for years. With this line, he’s turning the tide towards a more unisex vibe, since he’s been rocking Chanel’s womenswear belts and sweaters and thinks the items shouldn’t be gender-specific.